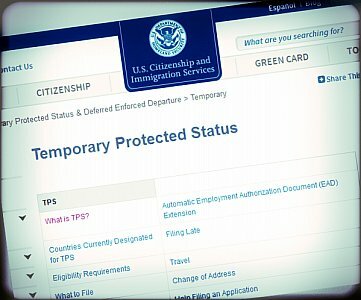 Several days ago I wrote, "The Amnesty 'Me Toos' Begin", which discussed a U.S. Chamber of Commerce letter asking the Department of Homeland Security (DHS) to extend, across-the-board, temporary protected status (TPS) for a variety of recipients from several countries — most of whom have been here long past the ostensible reason they were granted TSP status in the first place. The letter, while acknowledging that TPS was intended as a short-term safeguard, went on to suggest that because the government had allowed the recipients to remain in the United States for years (sometimes decades), a "permanent solution" needed to be crafted for them. There was no overt mention of the ongoing debate over amnesty for "Dreamers" (illegal aliens who arrived in the United States as youths), but that is clearly an unspoken subtext of the Chamber of Commerce letter. Sure enough, as night follows day, Rep. Carlos Curbelo, a Republican member of Congress from South Florida, promptly introduced the ESPERER Act, which would grant amnesty to TPS recipients from Haiti, Nicaragua, El Salvador, and Honduras. Apparently the entire South Florida congressional delegation has endorsed the bill. In 2015, Ros Lehtinen was among a select group of lawmakers who urged the government to offer TPS to Guatemalans residing illegally in the United States, which would have affected tens of thousands of Guatemalans pouring across our southern border in a human tidal wave, and doubtless encouraged tens of thousands more to make the journey. The problem with TPS clearly is that it has become a favorite tool of migrant advocates to push for concessions for one group of foreign nationals after another — and, once granted, to pressure the government to provide extension after extension after extension. Of course, after enough years, they then use this as justification to argue for an amnesty since the recipients have accrued so much time in the United States thanks to lax immigration policies and politicians who cater to special interests. Disappointingly, the Trump administration, which talked so tough about setting those lax immigration policies to rights on the campaign trail, has not shown itself fully committed to curbing the egregious abuses of the TPS program, as Center Executive Director Mark Krikorian has noted. In fact, one "unnamed" administration official has said the president would be open to Congress crafting a TPS amnesty solution — virtually the same verbiage used to try to push federal legislators into passing a bill granting amnesty to recipients of the Obama White House's unilateral executive program for "Dreamers" called Deferred Action for Childhood Arrivals (DACA). Well before Donald Trump was the Republican nominee, I heard a particularly politically savvy member of Congress state: "The important thing to remember, whenever you hear him talk, is that Trump is always negotiating." This well could be, but for my part I think his tweets, off-the-cuff pronouncements, and official-but-unnamed-source leaks create the amnesty equivalent of a revolution of rising expectations — one that can quickly engulf those who set such a train in motion, even though they believe they're using it as an "art of the deal" negotiating tactic. In my estimation, the president's base will not be particularly forgiving about serial amnesties because he has also created a revolution of rising expectations on the other side of the equation — expectations that, at least ostensibly, endorse the notion of a rational immigration system founded upon a respect for the rule of law. If you'll forgive me for mixing metaphors here, the question is a simple one: Once you've climbed on the amnesty tiger's back, exactly how do you get off without being mangled?